The buzz around metal replacement and lightweighting has become synonymous with automotive developments, with carmakers now spending millions to strip out excess kilos. The ultimate driver is, of course, efficiency and the push to meet impending EU tailpipe emission limits of 95g of CO2 per km across a manufacturer’s fleet. It is, and continues to be, a mammoth challenge. It seems, however, any pollution generating industry is now set to follow suit and even those traditional sectors that shy away from the leading edge are having to fast-track development. Materials, metal replacement and lightweighting – as seen in the automotive industry – have become a focus for innovating rail engineers that are looking to strip out weight from rolling stock to make operations more efficient. 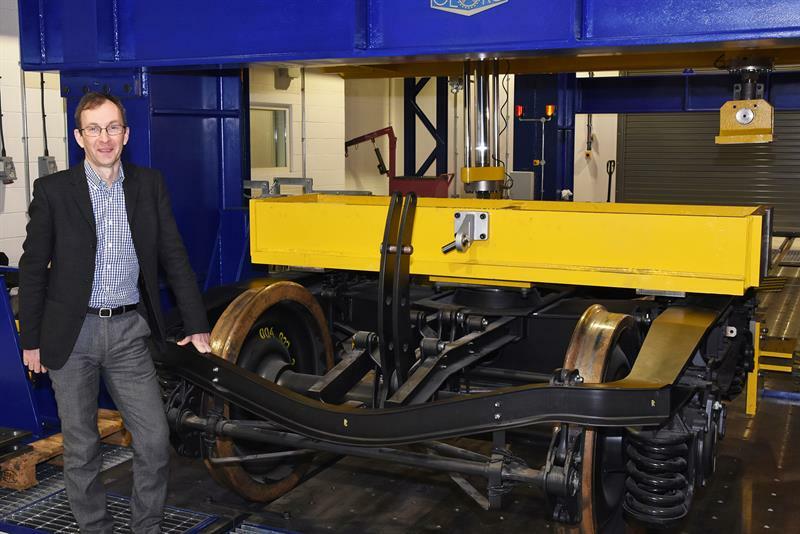 It’s led to a £300,000 project launched by the University of Huddersfield, which hopes to develop a new generations of rail vehicles made with carbon fibre and 3D printed parts. The investigation of novel materials and manufacturing processes is being carried out by the University’s Institute for Railway Research (IRR), which has been awarded the funding as part of an EU-backed project to develop lighter, more reliable, more comfortable and quieter rolling stock. The overall title of the project is called RUN2RAIL, which is itself an element of the EU Shift2Rail programme that fosters research and innovation in railways. The total funding allotted to RUN2RAIL is €2.7 million and it has four work packages, shared by leading engineering companies and universities throughout Europe. Huddersfield is participating in three of the packages, and is the lead for a project to investigate advanced materials for running gear. It aims to build upon the expert knowledge of the Institute in the design of railway bogies and their dynamic behaviour. Another strand of investigation will be the use of additive manufacturing techniques, most likely using selective laser melting (SLM) of metals and alloys. As the technology matures, components such as axle boxes and brackets for brakes have become candidates for the study. The RUN2RAIL project could lead to unprecedented usage of novel materials and processes in rolling stock construction and is due to be completed by August 2019. Whilst glass fibre composite materials are already well established in exterior rail parts and interiors, the use of carbon fibre has been limited owing to the high cost of the virgin carbon fibres. However, lightweighting within the rail industry has the potential to improve efficiency by reducing the weight of ancillary parts, increasing payloads and reducing wear and tear of rail infrastructure. Here, recycled carbon fibre reinforcements are becoming an increasingly attractive choice by offering a potential and affordable solution. Formed in 2011, ELG Carbon Fibre recycles and reuses the growing tonnage of ‘waste’ carbon fibre being created. Since its inception, it has created the world’s largest carbon fibre recycling plant in Coseley, in the West Midlands. ELG Carbon Fibre CARBISO Nonwoven mats are made from either 100% recycled carbon fibre or from blended hybrid thermoplastic fibres that can be compression moulded, processed as sheet moulding compounds or even as a prepreg. These materials are particularly well suited to flat panel parts such as floors, roof panels and walls, as well as more complex interior or exterior components. It recently began a project with the Rail Safety and Standards Board to both reduce weight and optimise vertical and transverse stiffness in order to decrease vehicle operating costs, infrastructure damage and environmental impact. The two-year £1.25 million project will be delivered by a consortium of companies comprising Combined Composite Technologies (CCT), the University of Birmingham, the University of Huddersfield, with additional support from Alstom. Here, ELG Carbon Fibre will be responsible for the multi-material design, in which recycled carbon fibres are expected to feature prominently, in order to meet cost and performance targets. Phase 1 of the project will see the consortium develop an optimised design and work with the appropriate bodies to address the regulatory framework for primary composite structures in rail applications. Phase 2 of the project envisages the manufacture and testing of a number of full scale demonstrators under representative service conditions using the dynamic test rig at the University of Huddersfield. The research programme is expected to conclude in Q4 of 2018. It’s not just Europe racing ahead to incorporate more advanced materials on rolling stock. 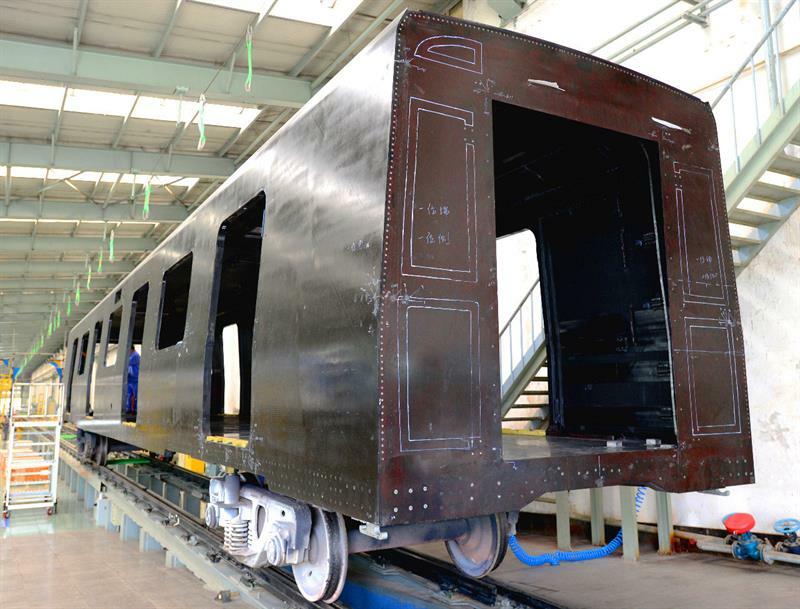 CRRC Changchun Railway Vehicles, a Chinese publicly traded rolling stock manufacturer, achieved significant breakthrough in rail transit by developing a carbon fibre train body. The full composite material car body looks set to reduce weight, energy consumption and emissions, but also explores the direction and application of carbon fibre composites in rail-based applications. The body is made up of a thin-walled cylindrical load-carrying structure 19m long, 2.8m wide and 3.5m high. It claims the body is structurally the same as the normal steel materials used, but weighs 35% less. This allows for higher carrying capacity, lower energy consumption, less lifecycle cost and less damage to rails. The company says it has overcome the difficulty of applying composite materials to the loading structures of rail vehicles, with more than 10 material performance tests, modular design verification, testing of more than 6,000 elements, full-size testing parts, as well as repetitive optimisation. The composite materials can be flexibly designed and integrally moulded so that the full-composite body integrates as many components and parts as possible, and be moulded as a whole.